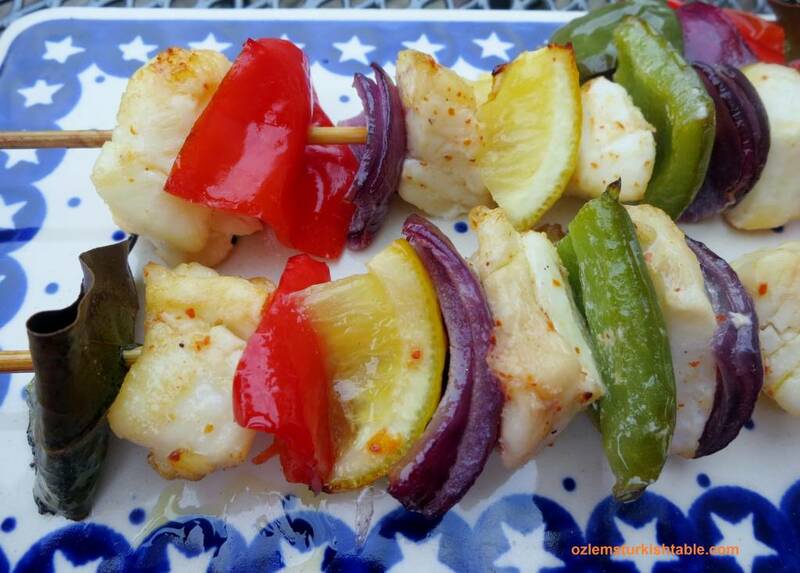 Healthy, delicious fish kebabs in olive oil, lemon juice and red pepper flakes marinade. This is such an easy and tasty fish kebab; you can use any firm fleshed fish like cod lion, tuna or salmon. Meaty swordfish, kilic baligi, is traditionally used at home and its firm, chunky flesh really works well in the kebabs. I like to roast extra vegetables by the side to complement the fish kebabs; with some boiled potatoes aside, these fish kebabs make a delicious, impressive meal for entertaining. 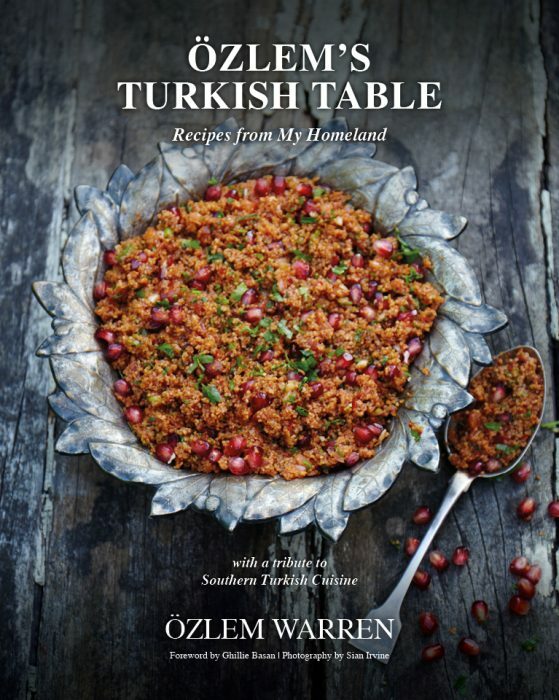 This and many other delicious, healthy Turkish recipes are included in my cookery book, Ozlem’s Turkish Table, Recipes from My Homeland, available to order at this link. Brush the left over marinade of olive oil, lemon juice and red pepper flakes over the skewers. It is worth marinating the fish prior cooking; a simple marinade of olive oil, refreshing lemon juice with a little spicy kick from red pepper flakes flavor the fish kebabs beautifully. I baked my fish kebabs in the oven. You can alternatively cook them over preheated barbecue, oven grill or hot griddle for 6 – 8 minutes, until they are cooked through and lightly browned. Fish kebabs with roasted vegetables by the side; a delicious, easy meal. 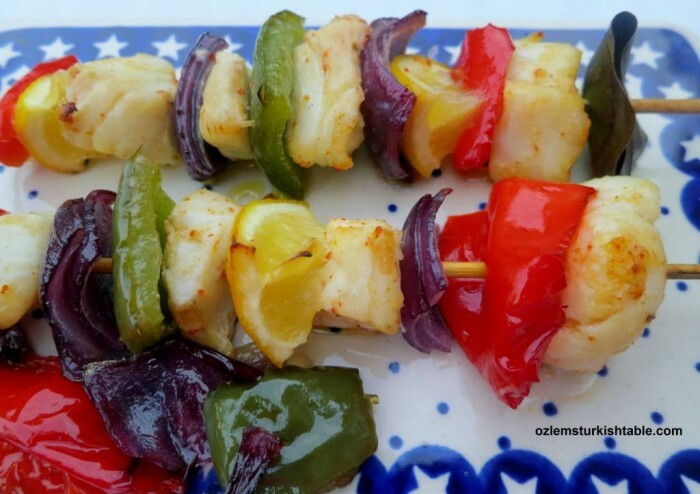 This is such and easy and tasty fish kebab; a simple marinade of olive oil, refreshing lemon juice with a little spicy kick from red pepper flakes flavor the fish kebabs beautifully. I like to roast extra vegetables by the side to complement the fish kebabs; with some boiled potatoes aside, these fish kebabs make a delicious, impressive meal for entertaining. Soak wooden skewers in water for 15 minutes before using. Cut the skinned, boneless cod lion (or your choice of firm fleshed fish) into bite size (about 3 cm/1.2” in.) chunks. Place the fish in a bowl and stir in the olive oil, lemon juice and red pepper flakes. Season the fish with salt and ground black pepper. 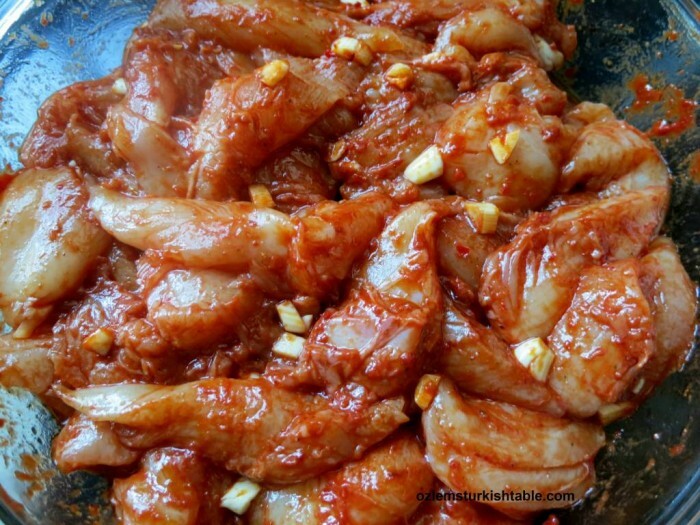 Gently coat the chunks of the fish with this marinade. Cover the bowl and set aside for 15 minutes to marinate and for the fish to absorb the flavors. 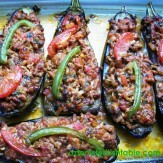 Place the chopped red onion, red pointy (or bell) pepper and green pepper slices on a baking tray. Drizzle 2 tbsp. olive oil over them. Season with salt, ground black pepper and mix well. 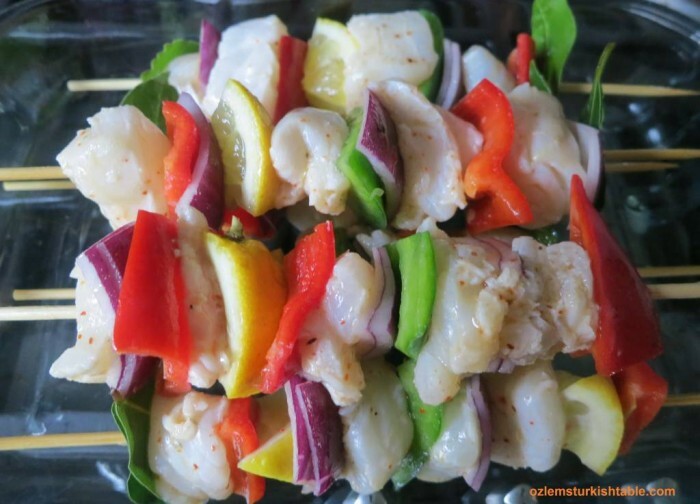 Thread the fish on to the skewers, alternating with a wedge of lemon, red onion slice, red and green pepper slices. Thread one or two bay leaves into each skewer. Brush the kebabs with any leftover marinade. Place the skewers at one side of your baking tray. Spread the remaining chopped vegetables next to the fish kebab skewers. 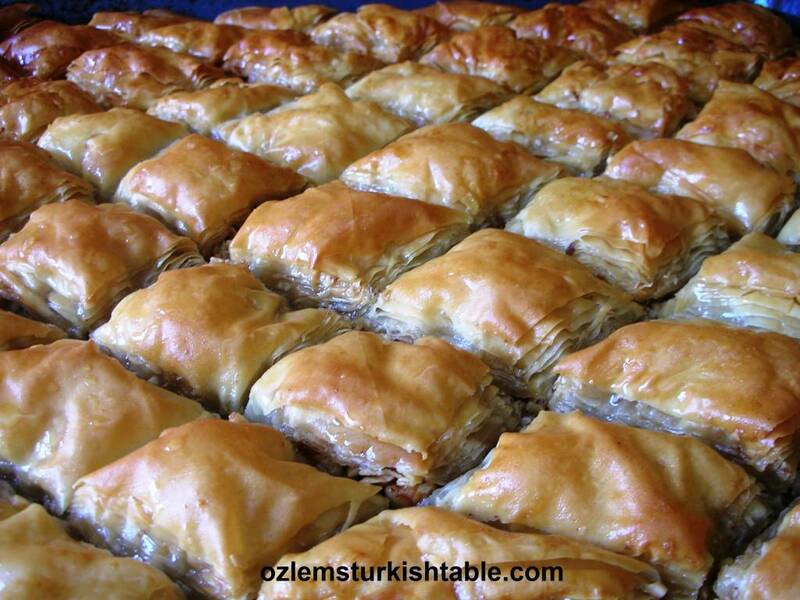 Bake in the preheated oven for 20 minutes. Serve the fish kebabs hot with roasted vegetables and a wedge of lemon by the side. Boiled or roasted potatoes also complement the fish kebabs well. 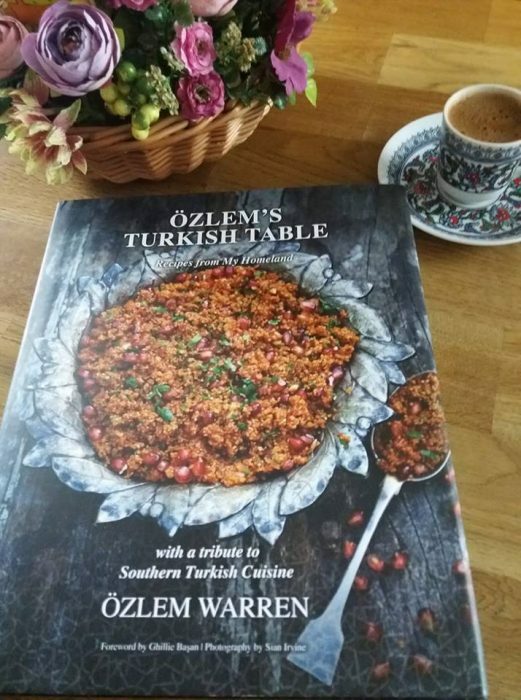 Inspiration for this delicious, gluten-free recipe, Eksili Tavuk; Chicken in lemon and pomegranate molasses sauce with vegetables, came from dear Janet, who is part of the wonderful blog, Archers of Okcular. Janet and Alan have been enjoying Eksili Tavuk, traditionally made with the delicious whole chicken from the villages nearby; I can just imagine how tasty that chicken must be. She asked me the recipe and so glad she did. 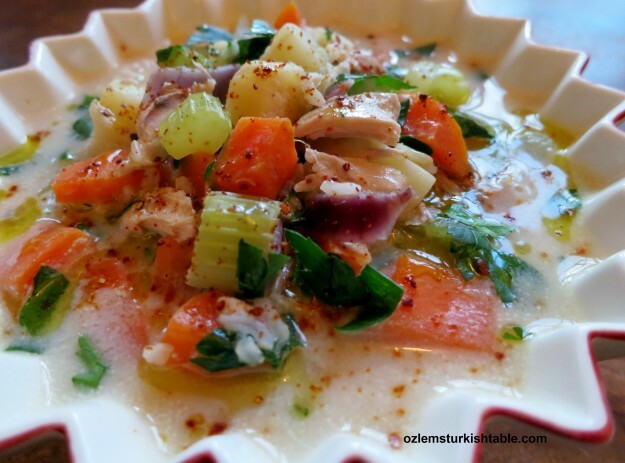 After some research, I came up with my version of Eksili Tavuk, using some seasonal vegetables like celeriac and chard in it. 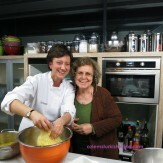 We greatly enjoyed this dish and I owe a big thanks to Janet! Marinating the chicken in pomegranate molasses, red pepper paste, garlic and spices add a lot of flavor. 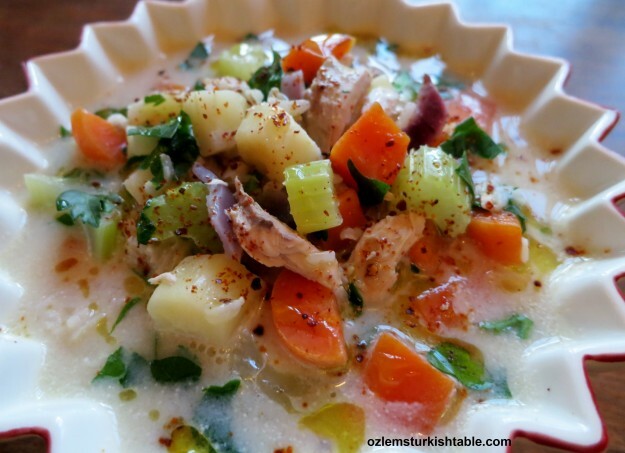 Traditional Eksili Tavuk in the Aegean Region is made with cooking a whole chicken in plenty of water and adding vegetables like potato, carrots and onions to it, as well as the lemon sauce. 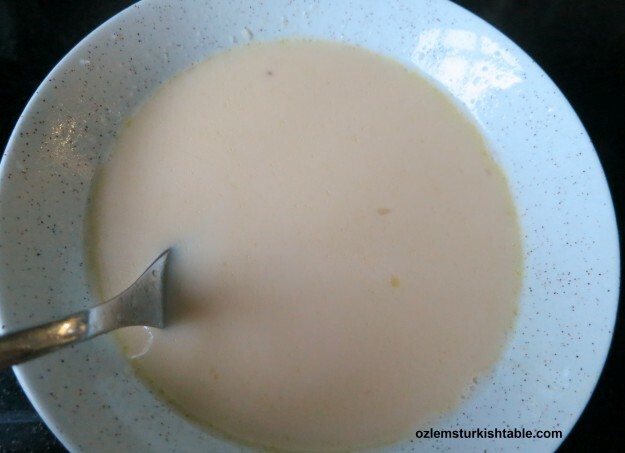 I have seen flour being used in the broth to thicken the sauce; it is a delicious dish. 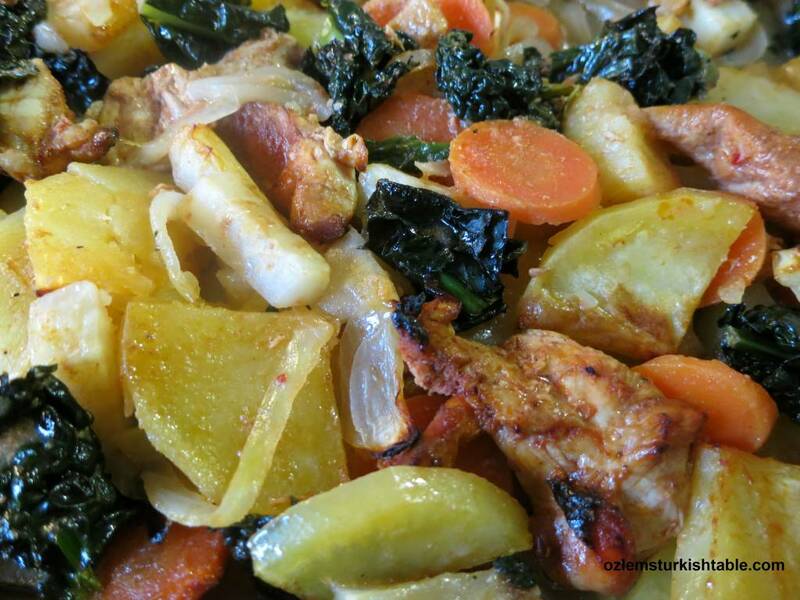 I have used chicken breast in my version and added celeriac and chard to the vegetable mix. 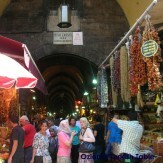 I have also added pomegranate molasses in the sauce; celeriac especially has been a perfect pair to the chicken in the tangy lemon and pomegranate sauce; the sweet and savory flavors really complemented one another very well (Pomegranate molasses, nar eksisi is widely used especially in southern Turkish cooking and add great flavor to salads, mezzes, stews. You can make your own pomegranate molasses with my recipe here, if you’d like). Marinating the chicken in cumin, red pepper flakes, garlic, tomato paste, red pepper paste, biber salcasi (if used), lemon juice and pomegranate molasses really worth the effort, add a delicious flavor to the chicken. 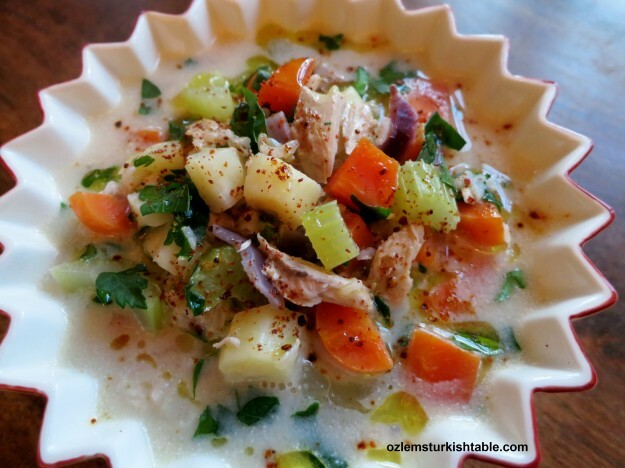 I baked my eksili tavuk; chicken with vegetables in pomegranate and lemon juice sauce, in the oven. It turned out to be an easy, wholesome and delicious all in one pot dish that we loved and will be revisiting often. 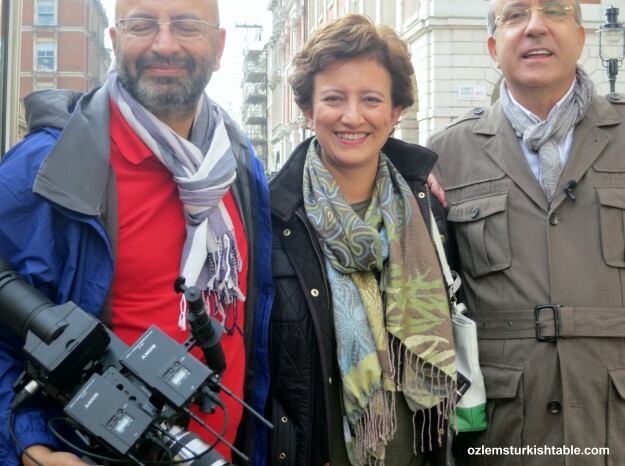 Many thanks for the inspiration, Janet, hope you all enjoy it! Cut the chicken into small chunks and place in a large bowl. Marinate the chicken in cumin, red pepper flakes, garlic, tomato paste, red pepper paste (if used), lemon juice and pomegranate molasses. Season with salt and freshly ground black pepper and mix well so that all the ingredients coat the chicken pieces. Cover and keep in the fridge to marinate for 30 minutes. While the chicken is marinating, prepare the vegetables. Cut the outer skin of celeriac root and slice in chunky strips. Rub the celeriac with 1 tbsp. lemon juice to avoid discoloring. Combine the celeriac with the other vegetables chopped, except chard, in a baking dish. Add the 2 tbsp. olive oil, season with salt and ground black pepper and mix well. Stir in the marinated chicken to the vegetables mixture and combine well. Pour in the1.2 liters/2 pints/5 cups water and mix well. After 30 minutes, stir in the chopped chard to the mixture and give a good stir. Cover and bake 10 -15 minutes more, until the chard is tender and chicken is cooked. Serve hot with crusty bread aside.